Back to top using bootstrap, we already discussed some tutorials about bootstrap. 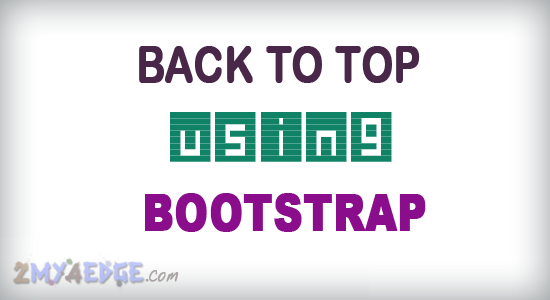 Bootstrap makes the work very simple like that, to we are going to see about back to top onclick using Bootstrap with some script. This is one of the simple method to use this scroll top function. let me explain you in details. already i did with same concept on back to top like Animated scroll to top by using Jquery, but that is with jquery without bootstrap so that is not responsive. but this one is responsive, because we are using Bootstrap. let see the coding. <a id="back-to-top" href="#" class="btn btn-primary btn-lg back-to-top"
we can change that 800 to any time, and that > 50 is for pixels, if we come below more than 50px of your browser, that back to top will be appear. we can change that as we need. I think it is really helpful and simple for back to top. thanks for you attention. where specifically do we place this coding? i have both a bootstrap.css and a jquery.js file that i can edit.